For Mounting Antenna Rotors onto 1.25 inch "T" post. Fastens to 25G Tower Rail with Saddle "U" Clamps. The ROHN 25G tower is a popular choice for large VHF/UHF antennas and medium sized HF antennas. The 25G tower can be used inguyed, self-supporting or bracketed configurations according to specifications in the ROHN catalog. Consult ROHN Catalog Links at Footer Section below for ROHN 25G Tower Details. 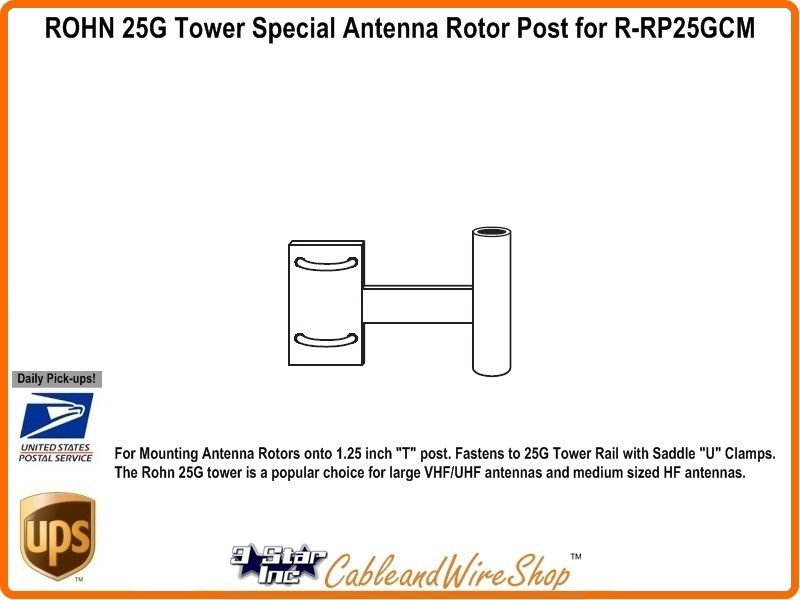 Note: ROHN RP25GCM Antenna Rotor Post is Galvanized Steel "T" Tube Post with (2) "U" Bolts to attach to any Side Rail anywhere on a 25G Tower Section for Mounting a Special CM Attachment Style Light Duty Antenna Rotor onto the Post. American Steel. Buy ROHN, Buy American.